The cultural web is a tool which allows you to question your current culture and start creating a new one more akin to the organisation’s needs. Essentially, an organisations culture is the way things are done. It becomes the routine and no-one tends to question it because “that’s the way it’s always been”. Sometimes this is a good thing because it can speed up what might otherwise be difficult processes. However it is also a hindrance because companies become accustomed to a certain way of doing something and shy away from change. This is problematic when change is needed, whether because of merging with another organisation or just general growth that makes the existing culture outdated. The cultural web is a tool which allows you to question your current culture and start creating a new one more akin to the organisation’s needs. 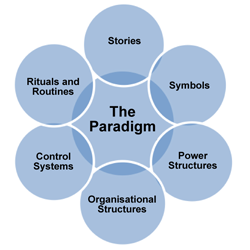 It identifies the six main areas that make up the working environment “paradigm”, the assumptions taken for granted within the organisation. To use the cultural web effectively there are three key steps: looking at the current culture, what the future culture needs to look like, the differences between the two. One of the hardest things to do is to get the managers to conceptualise the paradigm because they don’t see their assumptions as problematic. They need to question everything they take for granted because it all affects the culture and may need to be changed. Once all aspects of the culture have been discussed, it then becomes easier to see what areas require changing and how to go about effecting that change.